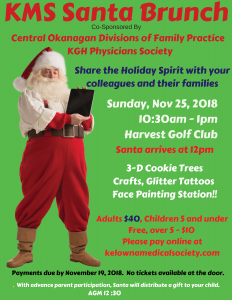 3D Cookie Trees, Crafts, Glitter Tattoos and a Face Painting Station! Santa arrives at 12 pm! Please pay online or leave your payment in the KMS box by Monday, November 19th to reserve your spot. This event sells out…please plan ahead!! For multiple tickets, select one ticket-type at a time and when at PayPal, click the “Continue Shopping” button to add the additional ticket-types. To RSVP for Kids 5 & Under, complete the form below.